Conveniently situated in downtown Yass, Cafe Dolcetto sits snugly within the rooms of a renovated heritage building, one of many that line the main drag. It’s cosy inside and a good escape from the Yass Valley chill. 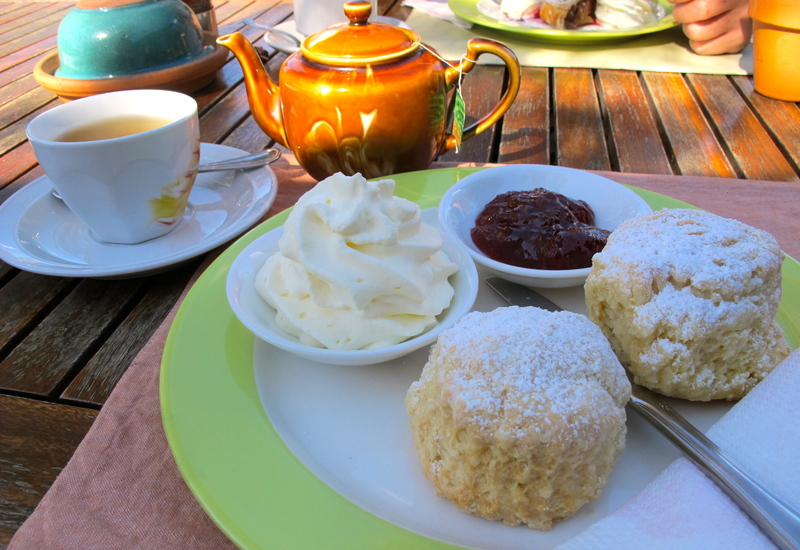 The scones are impressive; warm, light and fluffy, with a smidgen of icing sugar sprinkled on top. There’s ample jam and cream, and although the cream is freshly whipped, as opposed to being from a can, it’s quite light. Don’t leave it too late as it’s a popular spot even late in the day. Tea: A few black and herbal teabag choices served in a good-sized pot. Overall: A pleasant cafe in downtown Yass with friendly staff. If sitting on the shady patio, it won’t take long for Maggie the kelpie to find you. Don’t freak out when you feel a gentle brush of her nose on your thigh when she deposits a small rock onto the chair. She’s keen to play fetch, and goes from table to table trying her luck to see who will play. It’s a bit of entertainment and not just for our four-legged friend, and probably something you’d expect on a farm. However, this is not a ‘true’ farm, its way too slick. The place overlooks an extensive well-manicured olive grove, and the car park is geared up for coaches, with a kiddie’s playground to keep the young uns entertained. Like any good franchise, Grandmas does this well. The presentation of the scones, jam and cream are the same as that in Alexandria, although I find the buttery scones more crispy and biscuity – perhaps the chef went heavy on the butter? The rich raspberry jam and super thick (almost clotted cream) are served in identical small plastic containers and once again reflects the Grandmas brand. It’s a handy place to pull in to when travelling along the Federal Highway. Tea: A small range of T2 silk tea bags served in a small pot. Overall: The same Grandmas fare without the traffic congestion. The historical town of Gunning in the heart of sheep country is a quick diversion off the Hume Highway just south of Goulburn. You can’t miss the Merino Cafe with the sheep statues and bright umbrellas out the front. The scones weren’t on the menu, but I’m guessing because it was the weekend they may be baking. I spied the huge tray of scones sitting by the cash register looking very real and terribly inviting but I had to be quick as they were disappearing fast. 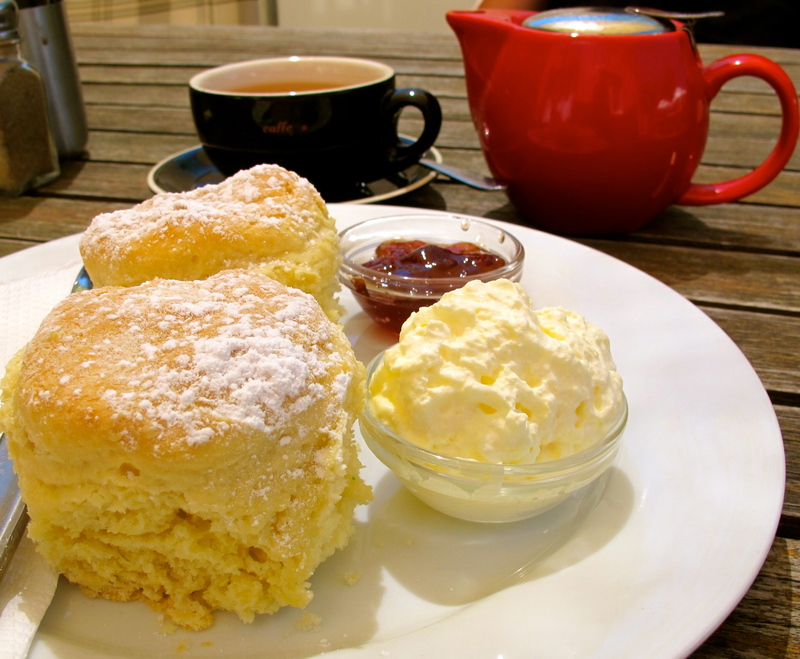 The big, fluffy scones still warm from the oven arrive at my table in the back outdoor courtyard lightly dusted with icing sugar and are absolutely delectable – exactly how I like them – soft, almost creamy in taste and texture. The Taylors of Harrogate tea is in a high quality silk-like teabag and lovely. 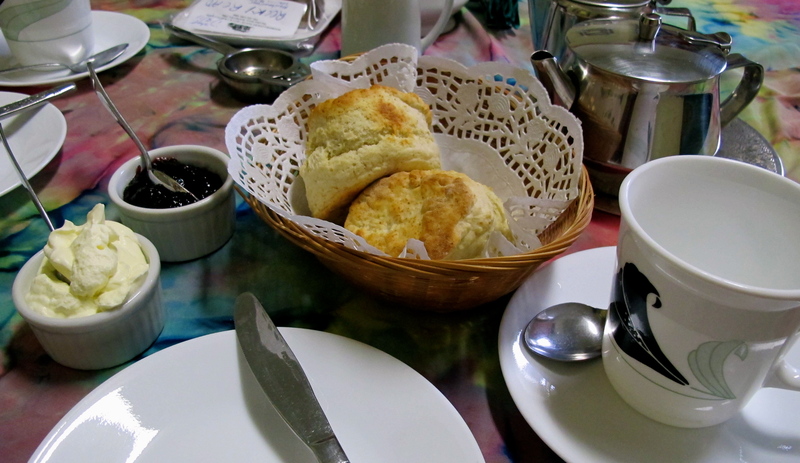 The scones were so perfect that even the substandard jam and cream couldn’t spoil it for me. Before you hit the Hume Highway, wander through the cafe and peruse the giftware and the wonderful photography depicting country life covering the walls. Tea: A variety of ‘Taylors of Harrogate’ teabags served in a small pot. Overall: Well worth the stop. The Paragon Cafe in Goulburn has been serving Greek dishes and cafe standards since 1940. Can you believe it? The cavernous space is more restaurant than cafe and reminds me of what a dance hall from that era, if you cleared out the furniture, might look like. It’s all hustle and bustle on a mid-week afternoon. It’s so hectic and big; you’d think it was Yum Cha in Sydney’s Chinatown! However, there’s nothing Chinese about the Paragon. It’s all booths and mirrored walls and one helluva long bar down almost one side of the restaurant. The menu is seriously extensive; expect old school dishes, so kale and quinoa devotees should look elsewhere. I am so excited to be here (I love anything with a history and booths), that I am flustered by the chock-a-block menu and can’t locate the Devonshire Tea. It’s certainly there, and the no fuss and efficient service has me tucking into light and fluffy scones in no time. I am disappointed by the sachets of jam – it a tad lazy. At least the super light cream taste’s like it’s from a cream canister as opposed to the sweet and sickly hybrid cream from a can, that’s a plus. Tea: A basic selection of Twining tea bags served in a small teapot. Overall: A step back in time with a menu to match. The heart of Riverbank of Queanbeyan is merely a shipping container with a kitchen attached, as well as a permanent open sided area connected to a sunny deck reaching towards the river’s edge. Along one side of the container a wisteria covered eating area spills out into Ray Morton Park, where seating is arranged beneath shady trees. It’s an excellent design, utilising very little space for the unimportant (like paying), but offering myriad seating choices for discerning diners. Apparently the cafe sells hundreds of scones daily. Whether that’s true or not is another story – but if true, I can understand why. Both the date and plain scones are exceptional; light and fluffy, with the date having just the right amount of fruit. I enquire about the jam and am told proudly that it’s Costco’s strawberry jam, which for a supermarket brand, is rather good. The cream is the weakest link: way too light and starts to melt in the summer heat. While you are there, wander through the Sensory Gardens, which is designed to engage all five senses: sight, touch, sound, scent and taste. Tea: A range of loose-leaf teas served in a small teapot. Overall: A beautiful location by the Queanbeyan River. I swear I’ve never seen the huge billboard on the Hume Highway blurting out that ‘Rollonin Cafe’ is famous for its Devonshire Teas. When did that go up? Was I always asleep when I passed the exit for Bowning? So when I see the sign I do just that, roll-on-in. The tiny village of Bowning has one of the first schools to be established in inland NSW and the antique shop on the opposite side of town has lots of trinkets. The traditional slab hut cafe was built a few years ago and has lots of seating both indoor and outdoor for passing highway trade. The chequered table cloths and staff dressed in maid’s bonnets and aprons gives it an Australiana bush cafe feel. It’s a difficult decision – should I choose the plain, date or pumpkin scones? The pumpkin scones win as I rarely get an opportunity to have them. They are huge so only one is served as part of the Devonshire Tea. 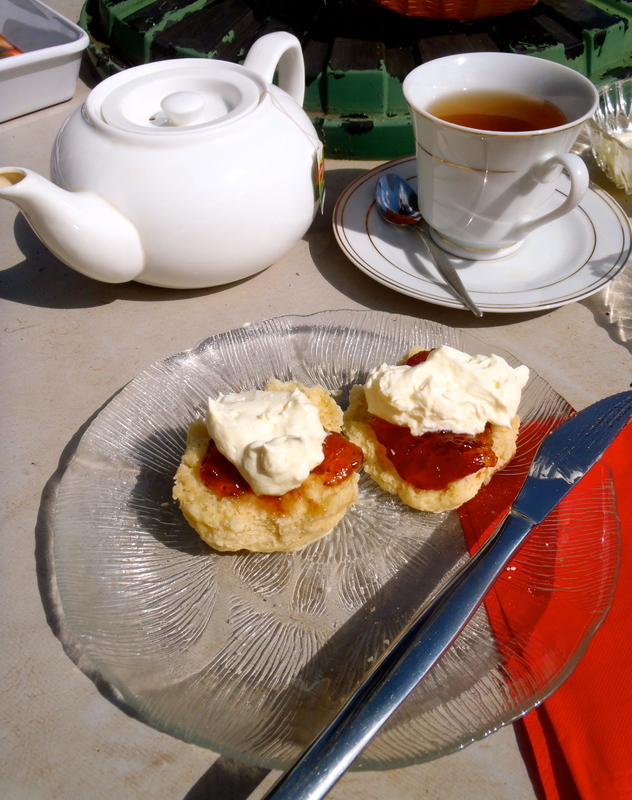 The scone has no nasty aftertaste or is too salty and has a lovely texture. My tasting buddy is truly impressed and adds it too his favourites (he’s missed lunch and is hungry). Personally I wouldn’t go that far, but they are good. The jam is nothing extraordinary and the cream is fresh but a bit light. If you’ve got kids, it’s a great stop as there are emus, a Shetland pony, a Clydesdale and probably more animals roaming around in a paddock next to the cafe. Tea: A good variety of tea bag teas served in a small pot. Be aware that herbal tea orders incur a 50c surcharge. Overall: A stop off with a touch of Australiana. ‘Where the hell is Boorowa?’ I hear you ask. Lying somewhere between Yass and Cowra, the tiny country town has a plethora of antique shops and visitors to fill them. We caught the farmers market just before the rain set in and stocked up on vegetables then stumbled into the old courthouse, bypassing the knitted tea cosies to find the Magistrate’s Tea Room. Exactly like Nanna’s kitchen, the older ladies who served us also sold the tea cosies and jams next door as well as acted as an informal visitors centre. 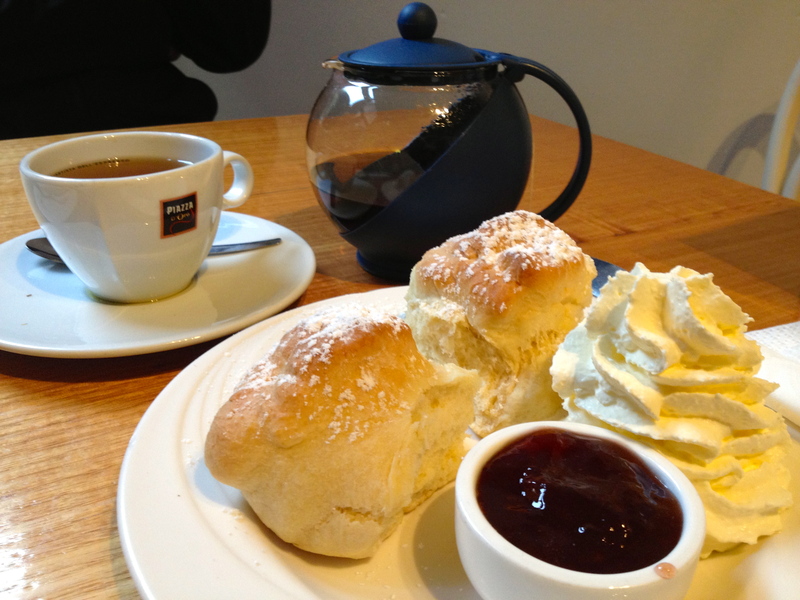 The scones are homemade and tasty, served with an ample amount of jam and cream. 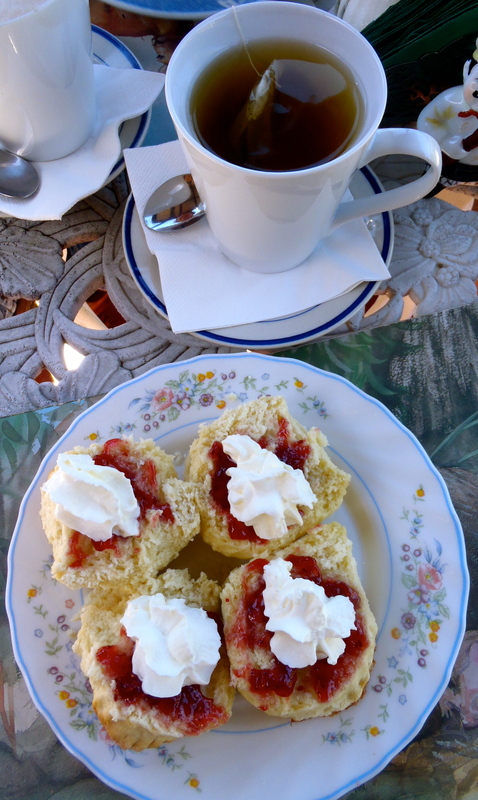 The superb homemade jam and freshly whipped cream top off the Devonshire Tea wonderfully. Truly well worth the diversion! Tea: As the lady said, there’s ‘a range of fancy teas’ with loose-leaf for standard black tea and teabags for the fancy stuff. Overall: Country Women’s Association (CWA) style at it’s best! I’m on my way to Wakefield Parkway in a bright red Mini Cooper. We’re about to test our skills behind the wheel of a V8 supercar so we stop in to The Rose’s Cafe for some sustenance. The cafe is situated in an old renovated church across from Goulburn’s lovely park in the town centre. According to the date on the outside of the building, it also had a life as a Technical College. Not particularly cosy and with bad acoustics (so sit outside if it’s warm) a different interior design may have created a nicer vibe. 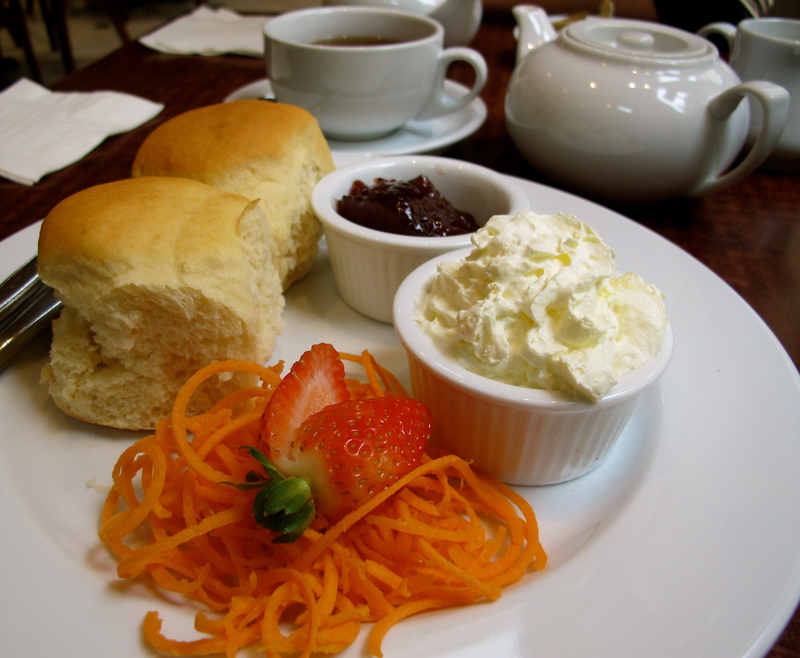 After placing the order and paying at the counter, the Devonshire Tea turned up looking as though it was on the wrong plate, served with an unusual garnish of grated carrot topped with a strawberry. This obscure presentation doesn’t make it taste better as the scones were too sweet and the can-whipped cream too light. Tea: A selection of teabags served a good-sized teapot. Overall: A nice location opposite the park. Yass must be a popular place because The Roses Cafe is on the spacious side, like a barrage of diners are expected at anytime. Part of The Roses Cafe group that have cafes in Goulburn and Mittagong, this outlet’s friendly staff and mouth watering goodies in the display cabinet will have you returning just to try it all. The ample seating includes a number of umbrella-shaded tables outside, a large main room and a smaller room through a doorway. The crispy scones taste like they have just come out of the oven. It’s possible as there is a bit of a wait. They aren’t my favourite as far as fresh scones go, but they do rate at the higher end of the scone scale. Paired with average jam and thickly whipped cream, the strawberry garnish is a nice touch but I’m not sure how the piece of lettuce found its way onto my plate. Tea: A basic range of LMDT silk teabags served in a small teapot. Overall: Clean, and cool when the temperature skyrockets in summer. Apart from the pub, there aren’t a lot of choices in Taralga when it comes to curbing hunger pains. Thirty minutes north of Goulburn, the Taralga Hotel attracts day-trippers, motorbike riders, and those passing through to other destinations. Towards the northern part of town, The Tangled Vine Cafe sits alongside a couple of other businesses and is one of the few eating options in town. If there is no one seated in the sunny area out the front of the cafe, it can look closed – I made that mistake a couple of times, so make sure to try the door. Once inside browse the old wares for sale, or snuggle up by the fire if it’s that sort of weather. The bite-size scones are perfect if you’ve had a big lunch or if dinner is not far off. The presentation is pretty with fresh strawberries, although the jam is average and the cream is light and tastes synthetic like it’s out of a can. A high-five for the bone china tea cup and saucer, it’s always a pleasure drinking out of a proper cup – shame about the ALDI Diplomat teabag though. Tea: The standard tea variety. A Diplomat tea bag served in a small pot. Overall: A sweet cafe in a chilled village. Adjacent to where the Dog on the Tuckerbox statue sits on the outskirts of Gundagai, is an old red rattler train carriage that has been turned in to an antique shop. It’s good for a browse, as there are some interesting items, and if you’re a train freak like my partner there’s some railroadiana for sale. The small cafe in the carriage does a Devonshire Tea, but I can’t say that it was enjoyable. It was served as in the picture above so we didn’t have the pleasure of ripping apart the scone and lashing on the jam and cream ourselves, which, is part of the process. Actually there was nothing redeemable about it, dry scones, cheap jam and sweet can whipped cream, and a cup of tea with a teabag. Make the effort for the train but not the Devonshire Tea. Tea: Only black tea served in a cup. The Woolpack Inn Museum, a two story heritage listed historic building located in the main street of Holbrook, has a very friendly and uncharacteristically modern cafe attached. The original Inn was opened in 1839, destroyed in a fire in 1895, but a rebuild had it trading until 1965. It was revived by volunteers and opened as a museum in 1971, but there’s still no excuse to the mismatch of the modern cafe. We’re allowed to sit outside amongst the outdoor museum as long as we don’t wander off as we haven’t bought an admission ticket. I don’t want to upset the friendly local ladies, so I stay put. The scones are magnificent, fresh out of granny’s oven – fluffy and slightly crispy on the outside. The jam is your standard supermarket strawberry jam and the cream is thick and freshly whipped. A gem of a place and I feel sorry for the locals when the highway bypass is complete. I wonder how many people will stop to see the real submarine? Tea: Only black tea served in a huge pot. 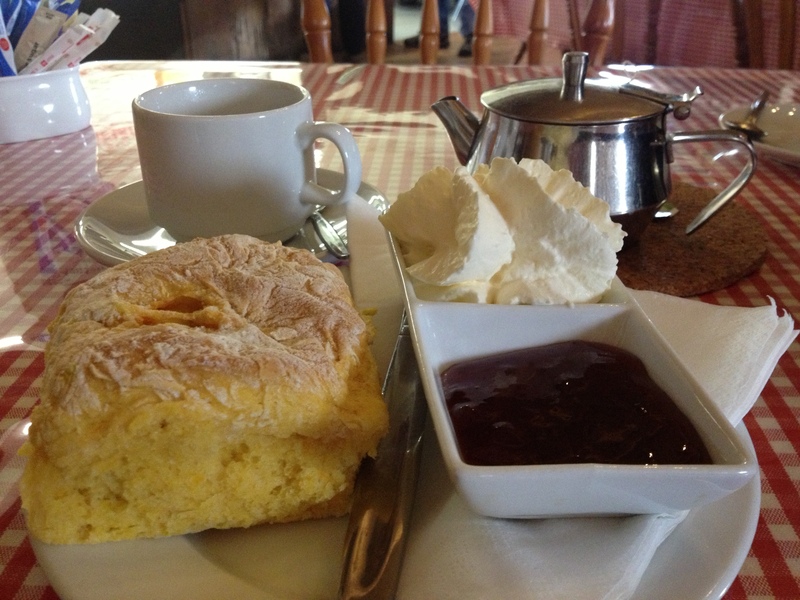 Just outside Cooma on the Jindabyne side, Miss Heidi’s Austrian Log Cabin Tea House is at the end of a windy road with a stunning outlook over Cooma. The Austrian style ski chalet is tre kitsch but very cosy, and no doubt in winter would be toasty warm. I visit in summer so I sit at one of the many tables in the garden under a big umbrella. The crispy scones are fresh although I’m not too keen on the icing sugar sprinkled on top. The jam is okay but there needs to be more of it and the cream is light and airy. It’s a quirky restaurant and a great stop on the way to or from the Snowy Mountains. Tea: Teabags with a variety of herbal teas, but not good quality. Overall: Makes you want to eat gingerbread and start yodeling.